Siegling Transilon HC belts (Highly-conductive) are particularly antistatic due to a conductive top face and underside. Measured in line with ISO 21178, the electrical surface resistivity of the top face and underside is ROA < 3 x 108 Ω. In the majority of belt types, the surface resistivity ROA of the top face and underside is even less than 1 x 107 Ω and as a result falls significantly short of the threshold stated in DIN-EN ISO 284. Numerous belt types also have an electrical volume resistance RD < 1 x 109 Ω, verified in accordance with ISO 21178. HC belts are particularly suitable for conveying electronic components and anywhere where, if the belts and the goods conveyed are charged, there is a detrimental effect on product quality e.g. in the nonwoven or chemical industries. If the belts have to be ESD safe, only HC belts can be used. 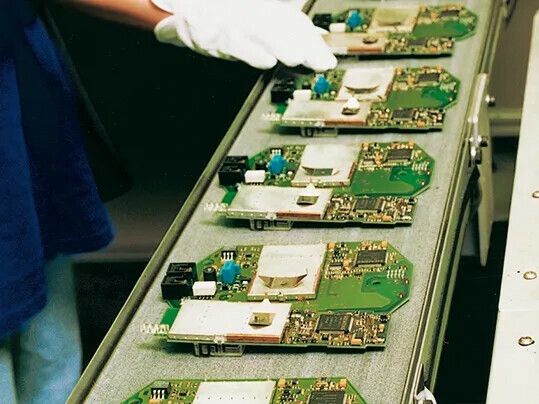 Should the belts be required for ESD applications, we recommend consulting application engineers at Forbo Movement Systems to discuss the technical details.